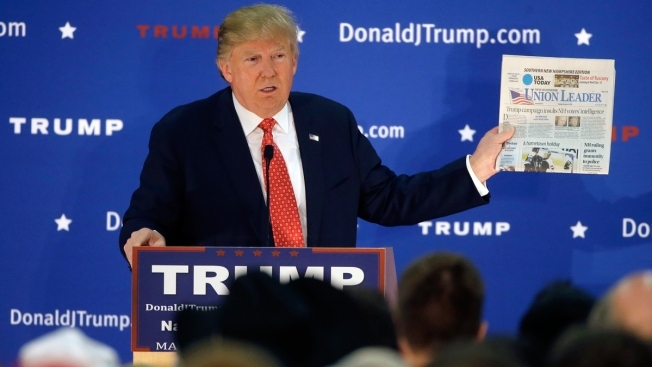 Republican presidential candidate Donald Trump displays a copy of the Union Leader newspaper while addressing an audience during a campaign event Monday, Dec. 28, 2015, in Nashua, N.H. New Hampshire's largest newspaper, the Union Leader, is the latest target of Trump's attacks against the news media. The leading New Hampshire newspaper has been removed from the state's Republican debate scheduled days before the first-in-the-nation primary, and GOP front-runner Donald Trump is claiming responsibility. "I am pleased to announce that I had the Union Leader removed from the upcoming debate," Trump tweeted Sunday. The Republican had publicly bashed the paper after a front-page editorial said he was an insult to New Hampshire voters' intelligence. Trump responded by holding up the paper at a Nashua rally and calling it "a pile of garbage." The Union Leader published a story Sunday evening confirming ABC News, which was hosting the debate, had severed ties with the paper. In the story, publisher Joseph McQuaid issued a statement expressing his disagreement with the decision. "We are amused by ABC News apparently just discovering that we endorse candidates and write editorials. We have been doing both for many years and it has never been a problem with ABC or other debate sponsors. "We consider ABC's actions to be spineless. Between bowing to the DNC and Trump, ABC is more concerned about appeasing the parties and candidates than informing voters. The Union Leader will continue to serve Granite Staters by being a reliable source of information about where candidates stand." Trump reacted by saying the paper "refuses to comment as to why they were kicked out of the ABC News debate like a dog." For its part, the New Hampshire Democratic Party issued a statement condemning the move and calling on the state's Republican U.S. senator to do the same. "This ridiculous attack on New Hampshire's statewide newspaper threatens the traditions of our First-in-the-Nation primary and makes it clear that the New Hampshire Republican Party has now fully embraced Donald Trump as their frontrunner," Chairman Ray Buckley said in the statement. "Senator Kelly Ayotte should denounce her party's actions to undermine our state's primary status." While putting the blame on ABC instead of Trump, the New Hampshire Republican Party similarly decried the decision. "The Union Leader has established itself as a trusted news source that, for decades, has sponsored some of New Hampshire’s biggest political debates," Chairman Jennifer Horn said. "It is disappointing that a national media outlet would exclude New Hampshire's only statewide newspaper given the important role the Union Leader plays in covering our First in the Nation primary." If their highly unethical behavior, including begging me for ads, isn’t questionable enough, they have endorsed a candidate who can’t win. This is really unfair and a conflict for all the other candidates. I said it should not be allowed and ABC agreed. UL has lost all credibility under Joe McQuaid w circulation dropping to record lows. They aren't worthy of representing the great people NH.